Stuart & Branigin opened its doors in 1878. 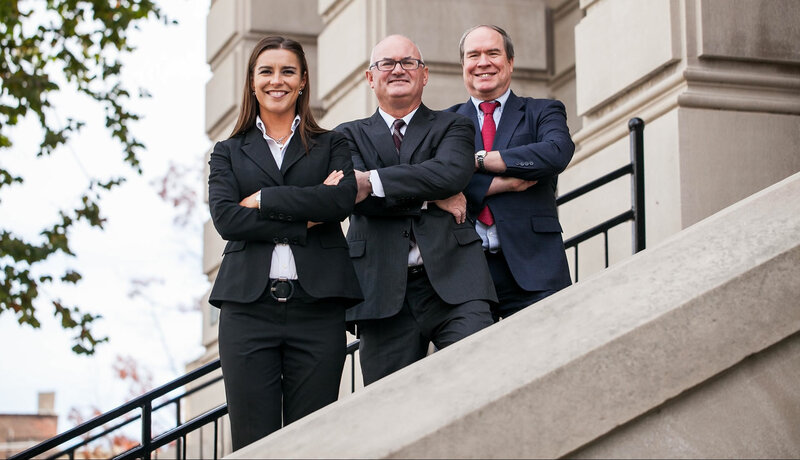 We have since enjoyed 130+ years of legal practice in Lafayette, Indiana. The firm traces its roots to 1878, when a Lafayette attorney named John Coffroth joined Thomas A. Stuart to form the law partnership of Coffroth and Stuart in Lafayette, Indiana. As friend and trusted legal advisor to John Purdue, John Coffroth helped establish Purdue University in 1869. Stuart & Branigin is proud to have represented Purdue and its associated foundations ever since in a full range of legal matters. In his practice, Thomas assisted his brother Charles B. Stuart, who had recently succeeded their father, former Indiana Supreme Court Justice William Z. Stuart, as Indiana counsel for the Toledo and Wabash Railroad Company (known today as Norfolk Southern Railway Company). The Stuart family’s connection with Toledo and Wabash Railroad marked the beginning of our firm’s long history of service to railroad clients, which today include Norfolk Southern, CSX, Amtrak, Canadian Pacific Railway and many others. 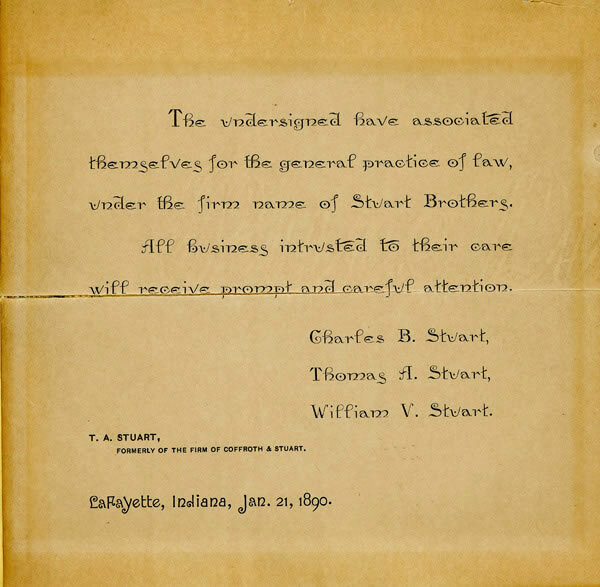 Thomas and Charles joined with a third brother, William V. Stuart, in 1890 to form the firm of Stuart Brothers. (View 1890 announcement). The brothers practiced together in Lafayette until Thomas’ death in 1892, after which Charles and William partnered with former Indiana Supreme Court Justice and Purdue trustee Edwin P. Hammond in 1892. Both Charles and William went on to serve as chairmen of the Purdue Board of Trustees. Charles’s and William’s nephew, Allison E. Stuart, joined his uncles and Justice Hammond in the practice in 1910. Allison would later serve as general counsel to Purdue University from 1925 until 1940, and thereafter became a trustee of the University. The firm moved into its current location in the Lafayette Life Building in the Spring of 1919 shortly after the building’s construction was completed. 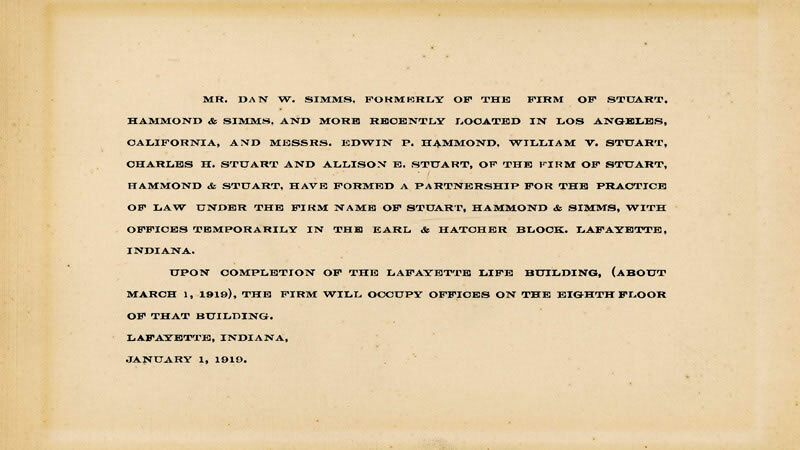 (View 1919 announcement) The firm has practiced from the corner of Third and Main Street in Lafayette since that time, purchasing the building in 1982. The firm’s location is adjacent to the United States District Court and across the street from the Tippecanoe County Courthouse and has long given Stuart & Branigin a perfect location from which to serve its clients’ legal needs. During this period, the firm continued its history as a key player in the economic development of Lafayette. The firm helped organize Rostone Corporation in 1928, and Lafayette National Bank in 1933. 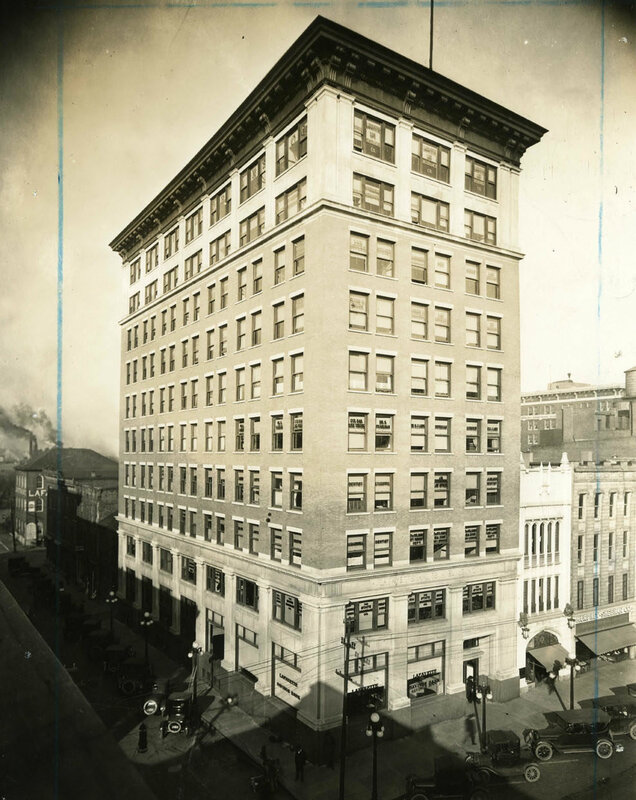 The firm moved into its current location in the Lafayette Life Building in the Spring of 1919. The firm has practiced from the corner of Third and Main Streets in Lafayette since that time, purchasing the building in 1982. Branigin would leave the firm at the onset of World War II to serve as a lieutenant colonel in the Judge Advocate General’s Department, rising to the position of Head of the Army’s Transportation Corps. He returned to Lafayette after the war and continued his practice of law at the firm, becoming a pivotal figure in the Lafayette business and legal community. He served as a trustee of Purdue University and as a director of the Lafayette Life Insurance Company. Branigin was also instrumental in the establishment of National Homes, Inc. in 1940, serving as that company’s general counsel and as director. 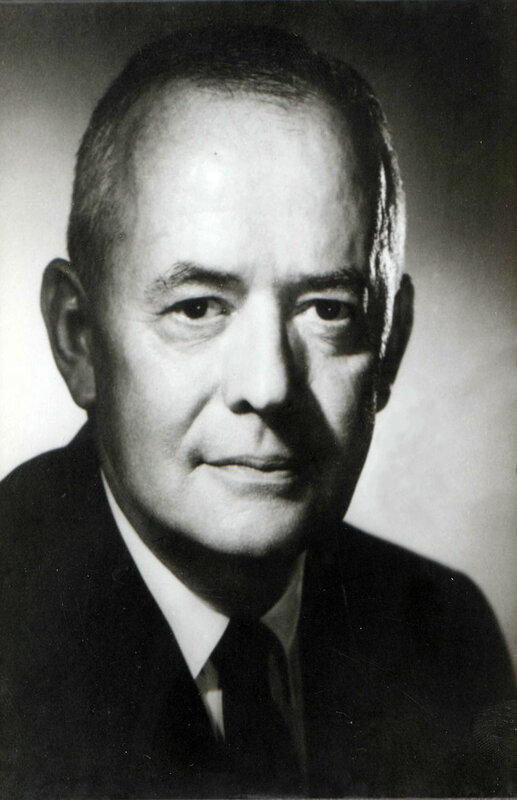 In 1964, Roger Branigin was elected the 42nd Governor of the State of Indiana. Highlights of Governor Branigin’s term include the elimination of the poll tax and personal property tax on household goods, repeal of the state’s “right to work” law, creation of the state’s department of natural resources and the construction of the Port of Indiana on Lake Michigan. Following his term, Branigin again returned to his corporate law practice at Stuart, Branigin, Ricks & Schilling in 1969. 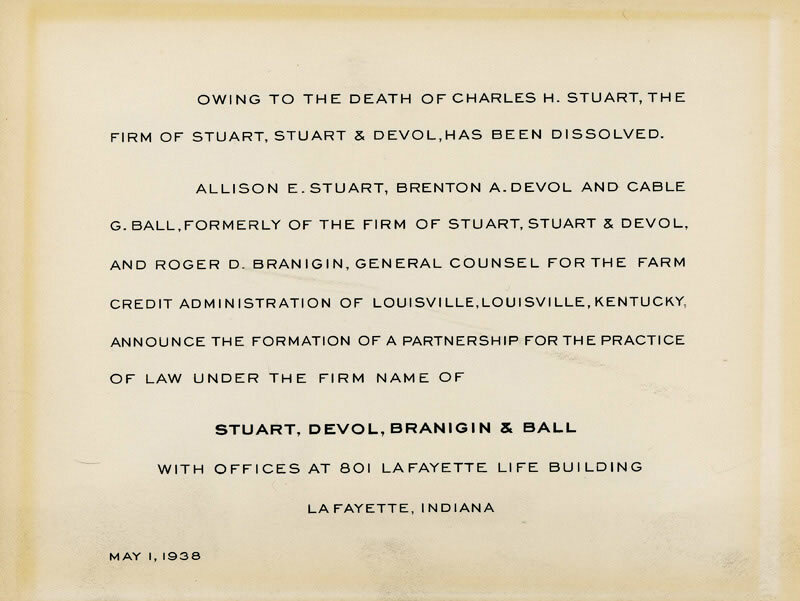 In 1982, the firm changed its name to “Stuart & Branigin” in recognition of Allison Stuart’s and Governor Branigin’s integral roles in the shaping of the firm. Continuing in the tradition of both men, the firm expanded right along with the Greater Lafayette community. Stuart & Branigin has represented, and continues to represent, local and national leaders in transportation, higher education, manufacturing, healthcare, banking and technology. The firm celebrated its 125th anniversary in 2003. Stuart & Branigin lawyers and staff were proud to reflect upon the firm’s 125-year legacy, which is built upon a reputation for success and satisfied clients. After more than a century, the firm continues to maintain its original values and proudly serves counsel for businesses, nonprofit agencies, public institutions, entrepreneurs, railroads, families and individuals. Stuart & Branigin Partner Anthony S. Benton was elected to serve as the firm’s Managing Partner in 2015. Under his leadership, Stuart & Branigin’s services were reorganized into five practice areas: Transportation, Private Client Services, Litigation and Disputes, Corporate and Non-profit Services and Personal Injury. We are Lafayette's largest firm with extensive experience.